There is no other Science Fiction TV show in history that I love like I love Farscape. This wasn’t always the case, however. I skipped nearly the entire first season after watching the pilot episode the night of its premiere and being severely underwhelmed. It wasn’t until the weekend or so before the Second Season premiere that I was home, bored, drinking, and flipping channels, when I stumbled across the tail end of a First Season marathon. It was the episode “Nerve” – the first of a two-part adventure that introduced the iconic villain Scorpius (Wayne Pygram) and the notion that Crichton (Ben Browder) had secret knowledge implanted in his brain that Scorpius was hot to dig out. When it was over I had to watch Part Two, “The Hidden Memory,” and I was hooked. Unfortunately, there were only two more episodes that season, but I watched them both and then waited with bated breath for the Season Two premiere and didn’t miss an episode thereafter. Then I spent a ridiculous amount of money on the original DVD releases, so I could catch up on the episodes I’d missed and revisit the ones I loved. There’s a lot of talk about how this was the show with Muppets. That’s the main point people bring up to differentiate Farscape from the dozens of Sci-fi shows that litter the cable graveyards. I suppose that’s the most obvious thing to talk about. 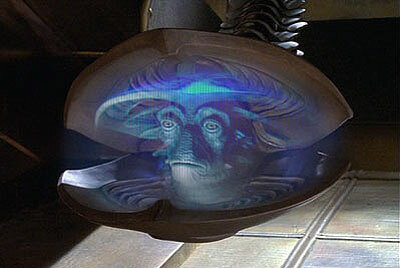 But for me, it was the writing first and the performances second that really set Farscape apart. It didn’t take long to forget there were even Muppets on-board because they are written and treated like real characters. In this show, every character recieved a healthy dose of narrative attention. 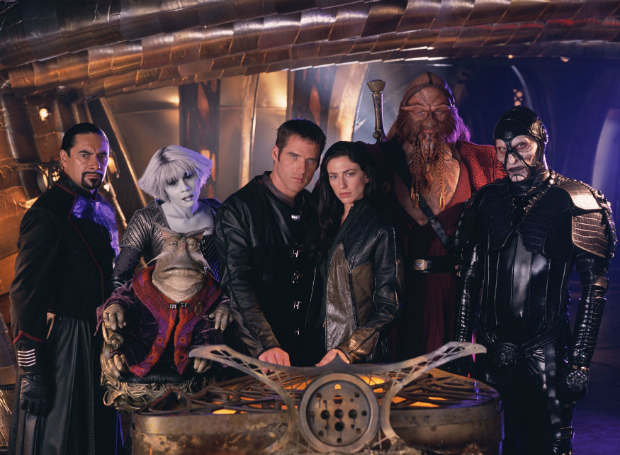 At its heart, Farscape is an epic romance set against the backdrop of Space Opera. That in itself is daring, given the typical gender of sci-fi fans. Boys want action and danger, and if Star Trek was any indication, sexless “love” and clean moral compasses, right? Well, Farscape brought the action and danger in spades, but it also brought heart, real sexuality, and a fuzzy morality that allowed for just about anything to happen. The main narrative dynamic of the first season was the hunt for Crichton and the gang on Moya, the sentient prison-ship, after Crichton is sucked through a wormhole above Earth and spat out in the middle of a battle, clipping a Peacekeeper ship and killing the pilot. That pilot’s brother, Bialar Crais (Lani Tupu) then spends the rest of the season hunting them down. On Moya, we have Ka D’Argo (Anthony Simcoe), a Luxan warrior searching for his kidnapped son, Pa’u Zotoh Zhaan (Virginia Hey), a bald blue part-plant Delvian priestess, Dominar Rygel XVI (voiced by Jonathan Hardy), the deposed ruler of the Hynarian Empire, and the “contaminated” Peacekeeper Aeryn Sun (Claudia Black). The developing relationship between Crichton and Aeryn is one of the most impressive and mature love stories on television and watching them get together only to be torn apart again and again was heartbreaking and invigorating. Particularly for a show on the Sci-fi Channel. But it was always an expensive show to produce, and by the time the fourth season came around, the ratings weren’t there to justify continuing, and even though a fifth season had been promised, Sci-fi Channel’s first original programming success story ended. That still hurts. A&E have collected all 88 episodes of the regular series onto 20 Blu-ray discs (the Peacekeeper Wars miniseries is not included here, as the rights are held by a different company), along with every single extra feature from the recent DVD releases of the complete series. That’s 15 hours of special features. A vast number of episodes have commentary tracks, deleted scenes and more, and every episode has English subtitles if that’s something you look for in a purchase. The only new feature is a retrospective documentary called Memories of Moya, which looks back at the entire series with recent interviews with cast members and the creators of the show. It’s a little over a half an hour and is a nice little treat for the fans. What isn’t such a treat is the fact that this isn’t a remastered release. According to the creative folks in charge, the original 35mm masters are lost, so what we have here is an upscaling from the PAL video masters. Even if the original masters were available, the first three seasons were filmed in SD with the traditional 1.33:1 ratio. All of the visual effects were filmed in SD and would have had to be recreated for a true HD master, making that likelihood pretty much moot. The final season was filmed in the widescreen 1.78:1 ratio and in higher quality. As such the Blu-ray visuals are only barely superior to the earlier DVD releases. Don’t get me wrong. It still looks better than the DVDs I have in my collection, but only just. And if you have the DVD releases you have the majority of the extras already. However, the audio has been improved with a new DTS-HD soundtrack that is extremely impressive. Your home audio system will be put to proper use with this release. If you’ve not yet taken the plunge, this is probably as good as it’s going to get for Farscape. While the video isn’t true Blu-ray quality, it’s better than the show has ever looked and it sounds fantastic. There are enough extras to keep you busy for ages, and just from a practical perspective, this is packaged in a very handy space-saving slim box. If you’re like me, you need all the shelf space you can get. All in all, this is a very nice package, but maybe only worth the price if you’ve not invested in the DVDs already. I, however, being a freak, think it’s well worth it. Now, somebody just needs to get a Blu-ray release of The Peacekeeper Wars in the pipeline. If you sit through all four seasons of this, you’re going to be desperately demanding it. If you’ve already got the compete series on DVD: 3.5 stars. If you haven’t yet taken the plunge: 4.5 stars.